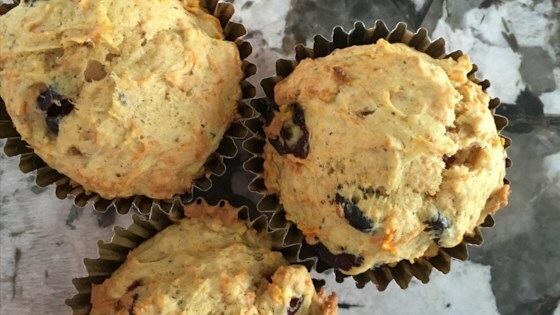 "I wanted a healthy breakfast muffin option that wasn't dry! The carrots give this such a delicious and moist texture. A lot can be added or left out of this recipe depending on taste and personal preference; popular options to include are raisins, ground nuts, or chocolate chips." Mix all-purpose flour, whole wheat flour, chia seeds, baking powder, salt, cinnamon, nutmeg, and ginger together in a large bowl. Beat butter, brown sugar, and white sugar together with an electric mixer in a large bowl until light and fluffy. Beat egg into the butter mixture. Mash banana into the butter mixture until smoothly incorporated. Fold carrot and orange zest into the mixture. Mix flour mixture into the butter mixture about 1/2 cup at a time to make a batter. Fold cranberries into the batter. Divide evenly between prepared muffin cups to fill nearly to the top. Bake in the preheated oven until a toothpick inserted into the center comes out clean, 20 to 30 minutes. Cool in the pans for 5 minutes before removing to cool completely on a wire rack. These were delicious! I left out the chia seeds but didn't change anything else. Very tasty! I thought these would not be moist enough, but they're fine. I used spelt flour and honey as the sweetener. Great muffins! I used a sweet potato instead of a banana and no chia seeds. Muffins turned out yummy. Very forgiving recipe. Came out delicious in spite of the liberties I had to take due to the ingredients I had on hand.